Yes , I tried leaving a comment too, but couldn't figure it out. Now able to do so on your amazing blog. Those little gingerbread men are so cute. 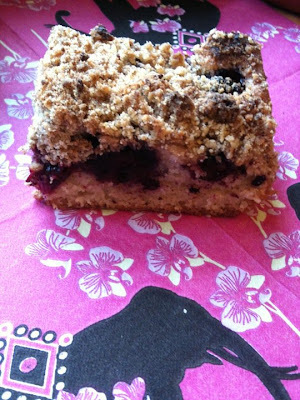 I've made blackcurrant crumble cakes before but not blackberry - these look delicious. When I've had a surplus of blackberries in the past, I've dunked them in alcohol with some sugar and a cinnamon stick for a few months and made some very nice blackberry liqueur. I love cakes with a crumble topping, my ideal comfort food. Your blackberry crumble cake looks divine! Thanks for the comments! I ended up making another one of these and some more apple and blackberry crumbles (which are waiting in the freezer!) I might go blackberry picking again just to make some blackberry liqueur! It's definitely one of my favourite comfort foods, and the second time I made the crumble cake, it was just as lovely when it's a little bit warm!